Our precast counterfort retaining wall is structurally and sustainably designed to retain clay or soil backfill, eliminating the need to haul off “unsuitable” material and the costs associated with expensive aggregates. The counterforts on our precast retaining walls extend about 50% as far as typical stems and 25% as far as MSE straps. Easily able to accommodate various utilities with our system. 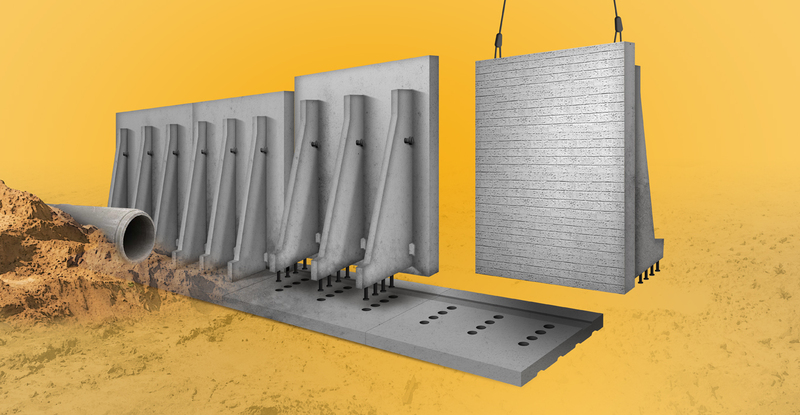 Proven, simple precast counterfort design provides excellent stiffness to minimize settlement without relying on tedious install techniques or friction on straps or stems. “Belt and suspender” or tapered and bonded connections that are completely protected from the elements are integrated in our precast counterfort retaining walls. Unique design featuring extendable “toe” in front of the wall that reduces bearing pressure and minimizes undercuts with our precast counterfort retaining wall. Typical 200-300 square feet, full-height unit speeds production on site while minimizing joints for a clean aesthetic. Additional 20 or 25 foot noise abatement extensions available. To view a detailed drawing click here to go to our Resources page. © 2019 Elevate Infrastructure, LLC.